Wind is simply the air in motion. Usually when we are talking about the wind it is the horizontal motion we are concerned about. If you hear a forecast of west winds of 10 to 20 mph that means the horizontal winds will be 10 to 20 mph FROM the west. Although we cannot actually see the air moving we can measure its motion by the force that it applies on objects. For example, on a windy day leaves rustling or trees swaying indicate that the wind is blowing. Officially, a wind vane measures the wind direction and an anemometer measures the wind speed. The vertical component of the wind is typically very small (except in thunderstorm updrafts) compared to the horizontal component, but is very important for determining the day to day weather. Rising air will cool, often to saturation, and can lead to clouds and precipitation. Sinking air warms causing evaporation of clouds and thus fair weather. You have probably seen a surface map marked with H's and L's which indicate high and low pressure centers. Surrounding these "highs" and "lows" are lines called isobars. "Iso" means "equal" and a "bar" is a unit of pressure so an isobar means equal pressure. We connect these areas or equal pressure with a line. Everywhere along each line is constant pressure. The closer the isobars are packed together the stronger the pressure gradient is. Pressure gradient is the difference in pressure between high and low pressure areas. Wind speed is directly proportional to the pressure gradient. This means the strongest winds are in the areas where the pressure gradient is the greatest. Also, notice that the wind direction (yellow arrows) is clockwise around the high pressure system and counter-clockwise around the low pressure system. In addition, the direction of the wind is across the isobars slightly, away from the center of the high pressure system and toward the center of the low pressure system. Why does this happen? To understand we need to examine the forces that govern the wind. There are three forces that cause the wind to move as it does. All three forces work together at the same time. The pressure gradient force (Pgf) is a force that tries to equalize pressure differences. This is the force that causes high pressure to push air toward low pressure. Thus air would flow from high to low pressure if the pressure gradient force was the only force acting on it. Wind is the movement of air over the surface of the Earth, from areas of high pressure to low pressure. But what causes the changes in pressure? There are a few concepts that we will have to explore to find exactly how this works, but ultimately all the energy on our planet comes from the Sun. The Sun gives out all sorts of radiation, including heat and light energy, and is so powerful that it radiates 170,000,000 GW of energy to the Earth! When this energy reaches the Earth, the ground and other surfaces absorb it, and heat the surrounding air. It's these differences in temperature, together with the rotation of our planet, that create the wind. About 1 to 2 per cent of the energy coming from the sun is converted into wind energy, which is enough to meet the electricity needs of the world three times over, and is a source of power that will never run out. Air, like all substances around us, has a certain density. The density of air is small but not zero. If air didn't weigh anything, the atmosphere would float off into space, which would be bad! There is only a thin layer of air surrounding the earth, what we know as our atmosphere. This extends upwards more than 50 kilometres above ground level. At this height the density is less than 1% of the ground level value. If the earth were the size of a football, the atmosphere would be equivalent to a 1mm thick layer on the surface of the football. Because there are miles of air above us and it is all pushing down, the air at the bottom gets squeezed creating a pressure, like the pressure you feel at the bottom of a swimming pool. The size of this pushing force over each unit of area is called the air pressure, or atmospheric pressure. The pressure on the earth's surface due to the air above us is about 100000 Pa - 101,325 Pa on average. That's 1Kg pushing on every square cm! 101,325 Pa is also commonly referred to as 'one atmosphere'. The weight of a column of water 10 meters high would be needed to increase the air pressure at the base of the column by 1 atmosphere. A barometer measures air pressure. If you took a barometer up in a hot air balloon you would see the pressure reading fall the higher the balloon goes. This happens because there is less air above the balloon the higher up into the atmosphere it goes. If you went too high the air pressure would become so low that you would not be able to breathe properly. This is why modern passenger jets have 'pressurised cabins' to keep the conditions similar to that at the earth's surface so the passengers are more comfortable. There is another unit of pressure called the "milli-bar" or mbar for short. There are exactly 100 Pascals per milli-bar, so 1000 Mb is about one atmosphere. If you watch the weather forecast on TV you may see a map showing atmospheric pressure. This is referred to as an isobar chart. 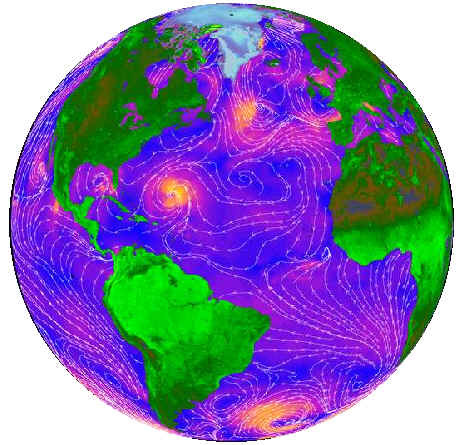 Isobars are similar to contour lines. Instead of the lines showing areas where the ground is the same height above sea level, the lines show areas where the atmospheric pressure is the same. The closer the lines are together the more rapidly the pressure changes from one place to another. This is similar to contour lines on a map, the closer they are together the more steep the slope. Why does the pressure vary from place to place and from day to day? As the earth spins on its axis it drags the atmosphere round with it. However, the air higher up in the atmosphere is less affected by this dragging/stirring effect. The difference in the air speed at different levels in the atmosphere causes the air to mix, forming turbulence, which causes wind at the earth's surface. The rotation of the earth causes another related phenomenon, the Coriolis force.This is best demonstrated by example. Take a piece of paper and pin it onto something which will not get damaged, e.g. a carpet. Rotate the paper anti clockwise (to represent the movement of the earth), whilst at the same time trying to draw a straight line. The line you draw will appear curved. A similar effect occurs when air is moving over the surface of the earth as it rotates. Instead of travelling in a straight line, the path of the moving air veers to the right. As a result instead of the air (or wind) moving in a straight line from areas of higher pressure to areas of lower pressure, it moves almost parallel to the isobars. The result is that the wind circles in a clockwise direction towards the area of low pressure. In the Southern hemisphere, the wind will circle in an anti-clockwise direction and clockwise in the Northern hemisphere. The warming effect of the sun varies with latitude and with the time of day. Warmer air is less dense than cooler air, and rises above it, so the pressure above the equator is lower than the pressure above the poles. The warming effect is greater over the equator as the sun is directly overhead. Nearer the earth's poles the angle at which the suns rays hit the earth is more acute, so the same amount of energy is spread over a greater area. The regions around equator, at 0� latitude are heated more by the sun than the rest of the globe. These hot areas are indicated in the warm colors, red, orange and yellow in this infrared picture of sea surface temperatures . Hot air is lighter than cold air and will rise into the sky until it reaches approximately 10 km (6 miles) altitude and will spread to the North and the South. If the globe did not rotate, the air would simply arrive at the North Pole and the South Pole, sink down, and return to the equator.